Adapted with permission from Octopus' Garden fanzine, Volume 26, Issue #2, December 2016. Review by Tom Aguiar. 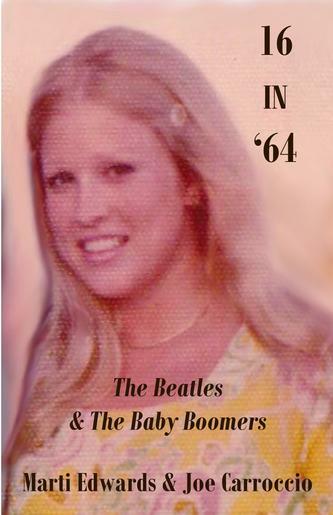 After seeing the Beatles on TV, Marti Edwards formed the Chicagoland Beatle People Fan Club, and she was able to grow the membership to over 1,200 people. Because of her ability to put together a successful fan club, Marti and some other club members got to meet the band in a press conference before their 1964 appearance at the International Amphitheater in Chicago, where they were able to make a special presentation of an honorary plaque from the fan club. Today, Edwards is a successful artist and photographer. It’s a feeling that all baby boomers share. And then there were the Beatles and all the kids of that time felt the euphoria that came along with Beatlemania. Edwards took courses, earning a Bachelor Degree in Fine Arts, at The School of the Art Institute in Chicago, where she grew her passion for the arts. Along with some high school friends, she decided to start a Beatles Fan Club. They decided to visit local radio station WLS where they held signs announcing the club to the disc jockeys and Edwards subsequently obtained a mentor / part time job position at the station. Though her position, she was able to obtain the name of the production company, along with a contact name and phone number, that was promoting the Beatles tour, and she and her friends reached out to them. All the while, the Chicagoland Beatle People Fan Club became very active at events and continued to grow. Edwards’s optimism, determination, and passion would eventually prove successful and she would ultimately fulfill her dream of meeting the Beatles. It was a special time and dreams still filled the souls of the baby boomer generation, along with the idealism to succeed and make a better world. Families and friendship were important and the Beatles became an intersecting point in people’s lives. What makes 16 in 64: The Beatles & the Baby Boomers so enjoyable is that the book is not really about the Beatles. It’s about the times when the story takes place and what kids of that generation experienced. It’s about the uniqueness of that time and how the baby boomers were a major part of why The Beatles and Beatlemania reached its feverish peak. It’s about a young girl’s love for the band and how it made a dream came true for her. This is what Edwards and co-author Joe Carroccio bring out, and this is what will take the reader, especially if you’re a baby boomer, to a special place in your life. It’s an enjoyable read about an enjoyable time and about a young girl’s journey of getting to experience a dream come true. Aaron Krerowicz is a noted Beatles scholar and lecturer who travels around the country giving presentations on the Beatles. This book, co-authored by his father, retired reporter John Krerowicz, is about their life on the road during one of Aaron’s lecture series tours. This is Aaron’s fourth book. His first book, TheBeatles & The Avant-Garde, was published in late 2014 (and reviewed in OG issue #26-1); his second, TheBeatles: Band of the Sixties, was released as a Kindle ebook in April 2015; and third, From The Shadow of JFK: The Rise of Beatlemania in America, was released in early June 2015. Aaron travels extensively throughout the U.S. giving lectures on the band and their music. He has appeared at numerous Beatles events as well as many other locales as an individual presenter, giving more than 250 presentations. Aaron also has a vast array of subjects based on his research on the Beatles and their music that he discusses throughout his touring. Although he was born 15 years after the Beatles disbanded, Aaron received a grant in 2011 from the University of Hartford to pursue his passion for the band, and he became a professional presenter and researcher in 2015. Krerowicz also holds advance degrees in classical music and composition and publishes a Beatles blog and his own newsletter. Krerowicz’s previous books were written in an academic format but Days in the Life is written in a much different style, a style where both father and son kept journals of the experiences on the road throughout this seven state lecture tour across the South and West. 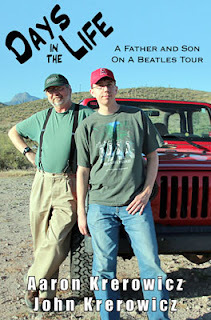 Their journals reveal to the reader the two men’s passion for music, the Beatles, baseball, and birding. In a sense, it is almost a travelogue of their life on the road. Although there is some discussion in the book about the topics Aaron presented on this road trip, what comes through loud and clear is the interaction between father and son. There are discussions about music and there is quiet time, as there is on any long journey. Aaron also got to indulge his love for baseball and John spent time on his passion of birding. The melding experiences of the trip expose the deep love, respect, and admiration between the two men that most have between us and our parents, but rarely get to experience in quite this way…alone together for an extended period. This is at the heart of the book and gives the reader a warm feeling. Although Days in the Life is not directly about the Beatles, it is the story of a father and son who share the Beatles as a common bond that is one part of their relationship, and this title is a very enjoyable read.